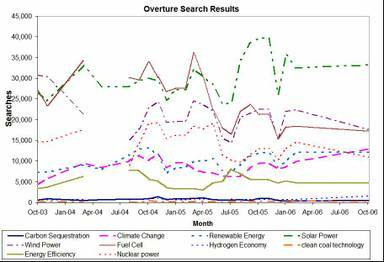 I remembered that it has been almost a year since we reported the climate change search statistics. After I discovered Google Trends, I thought that there was not much point in continuing with our overture search results. On the other hand, we have some data for about three years now, and there are at least a couple good results from our search trends, so I thought I should present them here. As you can see in the chart above, we haven't see a big change in most of the terms we have been searching. 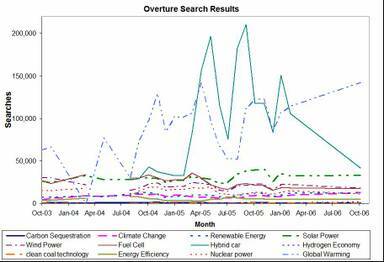 There is minor variation from month to month, but there is very little if any trend that at least I can observe except for a dropoff in searches for "Fuel Cell" and a small increase in "Climate Change". In the past few months, I have added "ethanol" and "biodiesel" to our search terms, but for now we do not have a trend. The second chart is a little bit more interesting as it includes a couple of heavy hitters that dwarf all the other search terms viz. "Global Warming" and "Hybrid Car". From this chart it is pretty clear that there is considerably more interest in "Global Warming" now as compared to three years ago. The average searches per month have about doubled in this period. This is pretty consistent with the US Google Trends search for "global warming". The second thing to notice is the wide fluctuation in the search for "Hybrid Car". After a few spikes in the searches for "Hybrid Car", the interest seems to be cooling. Perhaps it is a sign that Hybrids are now well known, or perhaps it may just be indicating that gasolines prices are on a downward path in the last few months. Again google trend for "Hybrid Car" shows a similar, although not exactly similar pattern. What do you make of these charts? I think we all should take solace in this trend. It won't be long now.